Our idea of equality for European citizen must include the right to the same level or standard of environmental living. For the Irish people this means wherever you live in the Republic, public planning and investments should be committed to support citizen towards a low carbon footprint in their daily lives. It is clear that public infrastructure investments with this aim in the West of Ireland are differing from those in the metropolitan area of Dublin although the relevant EU commissions are helpful and encouraging towards research, exchange and demonstration. For 20 years we have been experiencing that concepts and investments for the east oast include public infrastructure with this aim, especially low energy solutions like LUAS trams, cycling promotion etc. Rural Ireland on the other hand has not been given the same amount of attention. Along with the problems associated with land speculation the West has been left with an outdated american transport concept based on cars, and non - mandatory guidelines which allow ambiguous readings by local authorities. Most Irish political parties are still struggling to present comprehensive policies towards nationwide balance in this, and much of the offers by the EU in this field have been ignored. Working as an urban planner in Germany 30 years ago I saw funding given towards car borne solutions. During the celtic tiger years in particular when large amounts of funds were directed towards non-sustainable motorway projects that would later contribute to regional imbalance. I felt concerned that similar mistakes were taking place in Ireland as they had in Germany 30 years ago. On behalf of the Green Party/Comhaontas Glas we had the opportunity to present nationwide aspects to the Public Enquiry on the LUAS to Tallaght tram project. Among other aspects the crucial issue of the track width has been raised, with a view to the suitability of light rail rolling stock for the revival of closed railway routes like the Western Rail Corridor. With our commercial activities based in the beautiful environment of Sligo, we welcomed the upgrade to Sligo as a “Gateway City” because this central place has to serve a huge geographical area with low population densities - so the most advanced urban and transport concepts were required to provide low energy solutions fit for a future with less or no fossil burn. When the concept of the bizarre project of a National Road corridor project (1997) through the heart of Sligo town was proposed and passed one could not help but wonder where this would lead us. 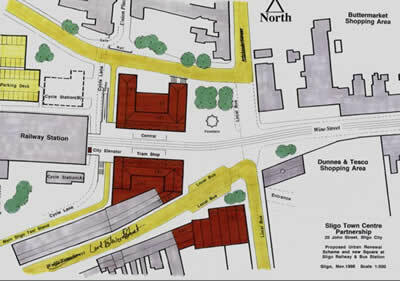 The completed project separated the Sligo Railway Station away from the commercial core of the town and devalued it. This I believe was against public opinion which was clearly opposed to this move. Public awareness and demonstration of “what is at stake” was asked for and in 1998 Healthbuild contributed with a unique “Objection Leaflet” to the local debate. Shared with local business and shopping center developers we discussed the role of Sligo Railway Station as an integrated “transport node” serving the regional city as well as reducing the burden of all car transit between the North and the West of the Irish isle going through the built-up environment of Sligo (due to lake and seaside restrictions). Easy and fast change of transport mode between train - bus - bike- taxi etc. was seen as key to acceptance against car based solutions. Our findings were endorsed by state authority Sustainable Energy Ireland and with the support of Sligo County Management the EU transport commission granted support for larger research on “Low Energy for Sligo transport solutions” which has addressed innovative and technically feasible options for a sustainable city, including the utilization of local renewable energy as main source for transport solutions. Together with Fermanagh District Council the “cross border” demonstration project of a “bikestation” was promoted to show the potential of electrically assisted bikes for day-by-day use as well as for tourist services. This project has encouraged many people living at the countryside to use bikes as a feasible daily transport option – and it has been contributing to Irish legislation on “pedelec”bikes through the Department for the Environment. Conclusion: We trusted two generations/two majorities of Sligo Urban Councillors which were elected by Sligo citizen with promises and a clear mandate to work against the “Sligo Mid Block Road” - this non-compliance with all good practices in urban planning. Councillors of both generations were reneging on their promises. This, combined with a manipulated “Public Enquiry” (four hours questioning of road engineers on public transport issues ignored in Report), this road project proceeded with the demolishing of 59 partly highly valuable dwellings and historic warehouses. Today in 2011 we see the Sligo railway terminus and the Sligo urban core devalued, with increased pressure to seek solutions in new roads . People crossing this dual carriage road or walking to the railway station being exposed to noise levels up to 91 dB. Unsafe streets are guiding town dwellers to use cars for the shortest distances. It will need a massive community and political effort to make good for the major step back in quality of life Sligo citizens are experiencing.